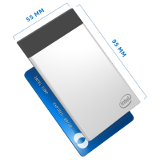 ion's microPC family is based on Intel® Compute Card products with full compute capabilities in a form factor that can slip into a shirt pocket, ready to use. Each Compute Card includes processor, RAM, storage, WiFi & Bluetooth. Intel's Compute Card Dock includes USB 3.0 ports, an HDMI port, a mini-DisplayPort and Gigabit Ethernet. More portable computing: ⇒ Read about the idea. ⇓Show me an example. More secure computing: ⇒ Read about the idea. ⇓Show me an example. More personal computing: ⇒ Read about the idea. ⇓Show me an example. Do you need a little more? Maybe the ion miniPC? ion microPC Quick Configurator as configured Choose 1 Card and multiple docks, multiple Cards and 1 dock, or whatever you need. Try to choose as many operating systems as cards. 0 1 2 3 Intel Compute Card Docks (including wired Ethernet, HDMI, miniDP, and 3x USB 3.0) with each kit. Each Intel Compute Card Dock has (1) mini DisplayPort and (1) HDMI connector. When slecting (2) monitors for use with a single Dock, select (1) DisplayPort and (1) HDMI.